صادقی, مهربان, فلاحی زاده, سعید, میرزایی, محسن. (1393). حذف بخش مواد آلی مقاوم فاضلابهای شهری با استفاده از فرایند تلفیقی لجن فعال/صافی چکنده. مجله آب و فاضلاب, 25(6), 106-113. 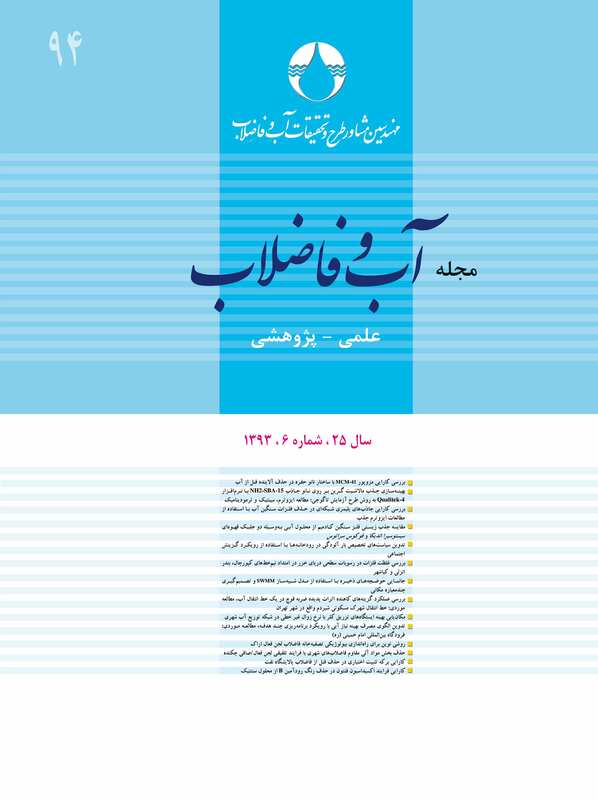 مهربان صادقی; سعید فلاحی زاده; محسن میرزایی. "حذف بخش مواد آلی مقاوم فاضلابهای شهری با استفاده از فرایند تلفیقی لجن فعال/صافی چکنده". مجله آب و فاضلاب, 25, 6, 1393, 106-113. صادقی, مهربان, فلاحی زاده, سعید, میرزایی, محسن. (1393). 'حذف بخش مواد آلی مقاوم فاضلابهای شهری با استفاده از فرایند تلفیقی لجن فعال/صافی چکنده', مجله آب و فاضلاب, 25(6), pp. 106-113. صادقی, مهربان, فلاحی زاده, سعید, میرزایی, محسن. حذف بخش مواد آلی مقاوم فاضلابهای شهری با استفاده از فرایند تلفیقی لجن فعال/صافی چکنده. مجله آب و فاضلاب, 1393; 25(6): 106-113. تخلیه ترکیباتفنلی و کلرینه، اسیدهایچرب، تانین، لیگنینومشتقاتآنهابهآب‌هایپذیرنده،خطراتجدیبرایموجودات آبزیایجاد می‌کند. در این پژوهش، عملکرد فرایند دو مرحله‌ای لجن فعال/صافی چکنده برای حذف مواد آلی مقاوم به تصفیه متعارف، ارزیابی شد و از تلفیق فرایند لجن فعال (در مقیاس کامل) با یک واحد صافی چکنده (در مقیاس نیمه صنعتی) استفاده شد.78/5 متر مکعب مدیای 2HX از جنس پلی پروپیلن و سطح ویژه 240 مترمربع بر مترمکعب در تانکی به حجم مفید 87/6 مترمکعب نصب شد. بارگذاری هیدرولیکی صافی در مرحله راه‌اندازی(90 روز) 6/3 مترمکعب بر ساعت و در مرحله بهره‌برداری (120 روز) 6 تا 6/3 مترمکعب بر ساعت بود و بهترین شرایط پساب در 4/5 مترمکعب بر ساعت حاصل شد. به‌منظور انجام تجربیات آزمایشگاهی، چهار راکتور به حجم 1256 سانتی‌مترمکعب با پساب خروجی و همزمان دو راکتور مشابه با سوبسترای گلوکز و COD معادل سایر راکتورها تغذیه و به‌مدت 480 ساعت در شرایط هوازی راهبری شدند. مواد مغذی، pH و DO (فاکتورهای کنترل محیطی)، COD کل و محلول راکتورها، دو بار در روز اندازه‌گیری ‌شد. کنترل فاکتورها تا تثبیت کامل مواد آلی ادامه یافت.COD محلول مواد آلی مقاوم، COD کل محلول، مواد معلق قابل تجزیه زیستی و قابل تجزیه زیستی کل، مواد معلق مقاوم و محلول قابل تجزیه زیستی در خروجی برای AS به‌ترتیب 40 ،227 ،94 ،281، 251 و 187 و برای AS/TF به‌ترتیب 20 ،227 ،104 ،311 ،241 و 207 میلی‌گرم در لیتر محاسبه شد. نتایج نشان داد فرایند تلفیقی در مقایسه با حالت مجزا قادر است مواد آلی مقاوم را به میزان دو برابر بیشتر حذف نماید. این پژوهش، ارتقاء سطح تصفیه فاضلاب‌ها را به‌وسیله تلفیق فرایندهای متعارف به اثبات رساند. The discharge of phenol and chlorinated compounds, fatty acids, tannin, lignin, and their by-products into receptive waters poses serious hazards for the aquatic life. In this study, the efficiency of a tow-step process of activated sludge-trickling filter (AS/TF) in the removal of inert chemical materials that defy conventional treatment processes was investigated. For this purpose, an integrated activated sludge process (industrial scale) was used sequentially with a trickling filter (pilot scale). Inside a tank with an effective volume of 6.87 m3 was installed 5.78 m3 of polypropylene 2HX media with a specific area of 240 m2/m3. The hydraulic loading rate (HLR) of the trickling filter during the startup period (90 days) was 3.6 m3/h which was raised to 3.6-6 m3/h in the operation period (120 days), with the best effluent quality achieved at HLR=5.4 m3/h. For the purposes of the experiments in this study, four reactors, each 1256 cm3 in volume, were fed the WWTP effluent and concurrently a glucose substrate containing a COD content equal to that fed to the four reactors was fed into two identical reactors; all the reactors were subsequently run for 480 h in aerobic conditions. Nutrients, pH, and DO (as environmental control indicators) as well as soluble and total COD were measured twice daily. The effluent values of soluble inert materials (SI), total soluble COD (STO), degradable suspended materials (XSO), degradable COD (CSO), refractory suspended materials (XI), and degradable soluble materials (SSO) for AS were calculated as 40, 227, 94, 281, 251, and 187, respectively, while the same parameters for the AS/TF were 20, 227, 104, 311, 241, and 207 mg/l, respectively. The results showed that the activated sludge process when combined with the trickling filter has a twofold capability, compared to when used alone, in removing inert COD. It was also shown that treatment levels in conventional WWTPs can be improved by integrating conventional treatment processes. 1. Ali, M., and Sreekrishnan, T. (2001). “Aquatic toxicity from pulp and paper mill effluents: Review.” Advances in Environmental Research, 5(2), 175-196. 2. Gürses, A., Yalçin, M., and Doğar, C. (2002). “Electrocoagulation of some reactive dyes: A statistical investigation of some electrochemical variables.” Waste Management, 22(5), 491-499. 3. Jeppsson, U. (1996). “Modelling aspects of wastewater treatment processes.” Department of Indusrial Electrical Engineering and Automation (IEA), Lund University Lund., Sweden. 4. Tchobanoglous, G., and Burton, F.L. (2003). Wastewater engineering, treatment, disposal and reuse, 4th Ed., MetCalf and Eddy Inc., Mc Graw –Hill, New York. 5. Henze, M.,(1992). “Characterization of wastewater for modelling of activated sludge processes.” Water Science and Technology, 25(6), 1-15. 6. Orhon, D., and Çokgör, E.U. (1997). “COD fractionation in wastewater characterization the state of the art.” J. of Chemical Technology and Biotechnology, 68(3), 283-293. 7. Germirli, F., Orhan, D., Artan, N., Ubay, E., and Gorgune, E. (1993). “Effect of two-stage treatment on the biological treatability of strong industrial wastes.” Water Science and Technology, 28(2), 145-154. 8. Ciner, F., and Sarioglu, M. (2006). “Determination of inert chemical oxygen demand (COD) fractions of Cumhuriyet University wastewater.” Global NEST J., 8(1), 31-36. 9. Pasztor, I., Thury, P., and Pulai, J. (2009). “Chemical oxygen demand fractions of municipal wastewater for modeling of wastewater treatment.” Int. J. Environ. Sci. Tech., 6(1), 51-56. 10. Nergis, Y., and sharif, M. (2010). “Chemical Oxygen Demand (COD) fractions characterization of Karachi metropolitan wastewater.” J. of the Chemical Society of Pakistan, 32(6), 711-716. 11. Orhon, D., Artan, N., and Ates, E. (1994). “A description of three methods for the determination of the initial inert particulate chemical oxygen demand of wastewater.” J. of Chemical Technology and Biotechnology, 61(1), 73-80. 12. Sadeghi, M., Masdaghi, A.R., Badkoubeh, A., Nabizadeh, R., and Solemanian, A. (2005). “Efficiency of advanced oxidation and hydroxyl technology in methyl terciary butyl ether(MTBE).” J. Shahrekord Uni. Med. Sci., 6(4), 24-32. 13. Lenore, S., Clesceri, A. E., Greenberg, A., D., and Eaton, A.D. (2003). Standard methods for the examination of water and wastewater, 20nd Ed., American Public Health, Washington, DC.